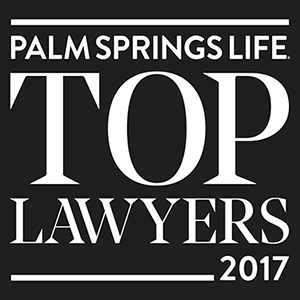 Attorneys John Jimenez and Jessica Jimenez are honored to have been awarded the title of Top Lawyers in Palm Springs for 2017. They will be listed in the Top Lawyers issue of Palm Springs Life Magazine later this month in the Criminal Defense category. A private reception will be held on June 22nd at Coda Gallery on El Paseo in Palm Desert. Since arriving in the Coachella Valley from San Diego, John Jimenez has been named among the Top Lawyers in Palm Springs 9 consecutive times.